I think we can all agree that University City is more than just a neighborhood; it’s a wonderful community to live and work. During the past year, UCCA membership dues were used to provide support and funding for many of the events and worthwhile organization that make University City a place we are proud to call home. UCCA sponsors the monthly newsletters, beautification projects such as the street banners, utility box artwork, and street median maintenance, as well as Neighborhood Watch, and the Holiday Tree and Menorah Lighting. Membership dues enabled UCCA to help support the Community Foundation (UCCF), the 4th of July Celebration, Summer Concerts, Library Friends, EdUCate, as well as many school and sports team projects, activities and fundraisers. Hundreds of UCCA volunteer residents joined UCCA to help with these events and projects as well as many others. At monthly meetings at the Community Library on Governor, UCCA provides a forum for residents to discuss concerns such as the Pure Water sewer pipeline, short term vacation rentals, the University Community Plan update and Miramar air traffic. The monthly gatherings are a chance to network with other neighbors and provide regular updates from local law enforcement and fire/rescue officers, and state and local leaders. 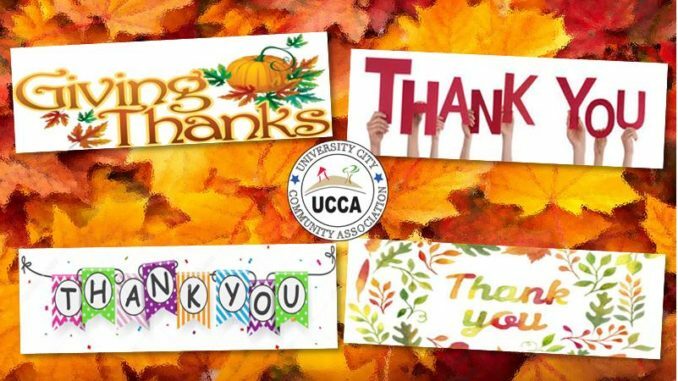 Thank you to all who support University City by joining UCCA. The 2019 membership drive begins this month. For your convenience, you may join online through PayPal at http://www.universitycitynews.org/join-ucca-today/. Or use the membership application envelope or coupon enclosed in the center section of the November newsletter.